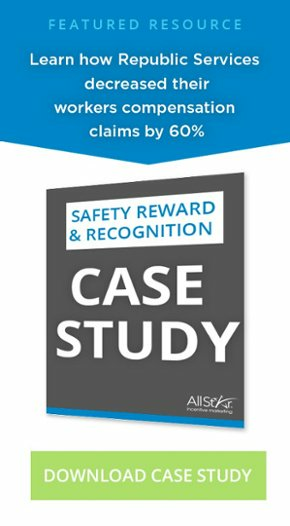 One key element is that the most successful safety incentive programs recognize and reward both for ongoing performance and for “above and beyond” behavior. That second part everyone gets, in that we all feel it is appropriate to recognize our safety “rock stars”. These are the workers that go above and beyond by joining safety committees, delivering tool box talks, mentoring new employees, making safety suggestions and reporting near misses. The tougher part for some to see is that rewarding the broad base for their consistent performance is equally, if not more, important. While the above & beyond portion of a program will reach 15-20% of the workforce on a sporadic basis, the performance side will reach 90-95% of the workforce on a consistent basis. Some companies bristle at rewarding workers for following the rules, but those that get past that objection, benefit from the most successful programs by far. In rewarding for performance (what OSHA calls “rate-based”), you don’t have to make it a layup, which is to say you don’t just reward workers for showing up. Instead you reward workers (at a reasonable level) for each month that they perform without incident, while also, for example, properly using PPE and attending all required safety meetings… whatever works best in supporting your goals. This will move the needle much further and faster than a one-dimensional program. You can make it even a bit more stringent by including other key elements, like attendance and training completion, but having a base line program safety recognition system is paramount for continuous improvement.